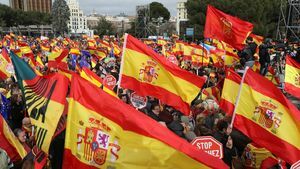 Spain's right-wing opposition says the Socialist government is giving in to separatist pressure. Court rules he could be released on bail pending a decision on his extradition to Spain on Thursday. Former Catalan separatist leader Carles Puigdemont says in a jail interview with two German members of parliament that he is "not a criminal" and that the campaign for the Spanish region's... independence is based on democracy and nonviolence. Transport authorities in the northeastern Spanish region said a main motorway remained blocked in Figueres, near the border with France. 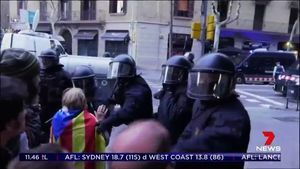 Protesters also caused disruptions in Barcelona. Former Catalan president, who lives in self-imposed exile in Belgium, had been visiting the country for talks with lawmakers Catalonia's former president Carles Puigdemont has foiled attempts by... Finnish police to arrest him under a European arrest warrant, after his lawyer confirmed on Saturday he had left the country. 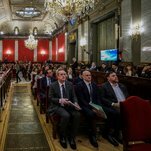 Catalonia's parliament is to hold a debate and vote on Thursday on a new candidate for regional president, Jordi Turull, who risks being disqualified from holding office over his role in the region's... separatist drive. The post Catalonia Parliament to vote on ex-govt spokesperson Jordi Turull’s candidature as region’s president today appeared first on Firstpost. Catalonia's former separatist leader, Carles Puigdemont, has withdrawn his candidacy for president of the Spanish region after months of political deadlock with Madrid.